A contemporary four bedroom villa with private swimming pool, outside dining, a barbeque and sunny courtyard. 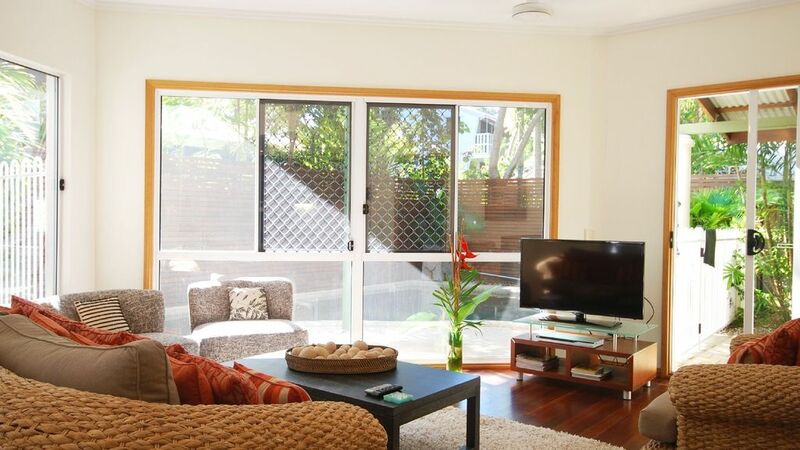 Within easy walking distance from both Four Mile Beach and the Port Douglas retail centre, this villa is ideal holiday accommodation for two families or a group of friends. Downstairs offers a choice of relaxation and entertainment options with two lounging areas, one with TV and DVD and the other with stereo sound system. There is also a WiFi internet connection at the villa. Formal dining is adjacent to a state of the art kitchen complete with stainless steel appliances and granite top benches. A walk in pantry is filled with a full inventory of chinaware, glasses, cutlery and cookware. A more casual dining area overlooks the pool and garden from a sun-drenched patio, perfect for alfresco dining and sunset drinks. Upstairs, the king size master bedroom has an en-suite bathroom and TV. The second Queen bedroom and third bedroom with two singles (or king bed) share a bathroom. Downstairs there is a fourth bedroom with two singles which can convert to a king bed, a powder room and laundry facilities. The villa has ducted air-conditioning with fans throughout. Waves had everything we needed. Very well set up and so comfortable. This house provided the perfect setting for our recent holiday in Port Douglas. With two families, and four kids under 10 years the house proved to be spacious, easy to keep clean and a relaxing refuge after a day at the beach. The pool was too deep for the younger kids to enjoy, but the older kids loved it. The evaporative cooling was very comfortable for the hot nights.